Something pretty thrilling happened over the weekend-- my book went up on Goodreads! It was one of those flailing-squealing-oh-my-gosh-look-I'm-an-author moments I'm still kind of shocked I get to experience. Then, I clicked a little link on the Goodreads page...and found my book up for pre-order on Amazon. I DIED. Right now, I'm sitting in my brand new office with a toddler on my lap, drinking apple cider herbal tea and feeling ridiculously happy. See, it's been a good long while since I've had my own "space." Living in small apartments with two kids doesn't leave much room, so I've been a laptop nomad for years now. My computer rotates around the house all day, and so does my writing space. It was hard for me to focus and get in the writing groove. So my wonderful family helped me out. We moved the two kids into one bedroom, which they're ridiculously excited about, and made the smallest bedroom my office. You guys, I HAVE SO MUCH SPACE. And it's specifically for me. And it's all full of decorations and pictures and things that inspire me. Already, it's helping me focus, and I'm so happy. And it's all because of my family. Sometimes, we focus so much on the writing part of our lives (online, at least) that we forget to mention the people that make it possible. So, here's my mention. My husband has believed in me from day one. Before day one, actually-- he's the one who encouraged me to get back into writing seriously. He's given me encouragement, time, space, and flowers of celebration. He's put up with writerly mood swings and taken days off work so I could go to writing conferences. Basically, he's my knight in shining armor. My kids don't understand what I'm doing yet. But they have been so flexible and willing to let mommy have her writing time. They've driven me crazy, and also kept me from the edge of crazy. They've reminded me how important and how precious and how incredible real life is. They keep me grounded, humble, and laughing. I know not everybody has the world's most supportive families. It can be hard to keep doing what you love when you don't have lots of support, and for that, I salute you people. But no matter what, try to take a moment today and be grateful for the people you love. Be grateful to them-- show them or tell them that. Because in the end, when books get the final rejection or go out of print or the reviews all come in at 2 stars, your family will still love you. And that is what matters most. So, my friends, who is your support network? Have you told your family you love them lately? I'm off to tell mine right now. Love it! So true. And I'm glad you got your writing space. It looks nice and cozy and ready to be used. Aww! That's so awesome they got you a writing space! It looks fantastic! Congrats on the book! Must go check it out! Even though I have a hard time finding (making?) time to write (with a full-time job and family and church responsibilities, etc...) I can't imagine doing it when you have young children at home! So, congratulations, and my hat's off to you. As for supportive family, my wife isn't a "reader" and doesn't always understand why I'm *still* working on my novel. Nonetheless, whether it's getting a new laptop or pushing me to sign up for Storymakers (I've been going the "lone writer" route so far) or talking me through a panic-attack of doubt, I couldn't do it without her encouragment. My family are supportive of my work, but not of my working. If I go to the dentist or hairdresser, they don't interrupt me but if I'm writing they think nothing of phoning me or dropping round! Familial support is incredibly important for the creative process. My wife is constantly trying to get out of me what I'm working on next, so she doesn't complain about the time I spend on my computer. 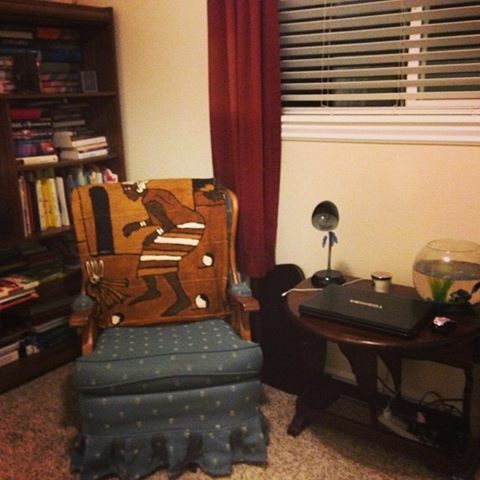 Having your own writing space is a huge help, so enjoy! This is a lovely post, Shallee, and so true that we don't appreciate all the time, the fact that our spouses and kids give us soooo much time off to pursue our dreams. Yeah, they definitely deserve a shout out. I've been to Goodreads! Congrats again! I keep my writing secret from most people; on the other hand, I'd say that fellow bloggers I've "met" through the blogosphere have become my support network with their kind words of encouragement. I like your writing space! As someone who still lives in a tiny apartment, I can definitely relate to the need for your own space that's just for writing. That's why I usually write in cafes. And congrats on the book! That's awesome! Congrats, it must be great to see your book on Goodreads and Amazon. Happy for you. So exciting that you're on GoodReads and Amazon! Congratulations! And yay for dedicated work space. It is definitely a major help. So great that you and your family found a way to make it work. Wahoo! How exciting. I remember that moment when it all became real. My neighbors must have thought someone died. Horrendously. It was that loud. I'm off to check it out. Yippee! What a lovely post. I wouldn't have gotten anywhere without the patience and understanding my husband and kids give me. I love your new site design. When did that happen and how did I miss it? Anyway, I added your book on Goodreads AND reviewed it :) We're besties after all! Yay about Goodreads! Your family loves you very much. Isn't it great to know they want you to succeed? Congrats and good luck!! You're right!! Family is SO, SO important. We need them behind us to keep our faith happening. Now that's not to say their all 100% supportive, but my inner circle is (my kids), so that's what counts. A well-deserved CONGRATULATIONS on the book release, Shallee. That's got to feel awesome. "Laptop nomad" -- yep, that's me. So cool that your family gives you the space you need. My wife is my Constant Reader and cheerleader; I started submitting my work for publication because of her insistence, and it's made all the difference. CONGRATS! I can't wait to read your book and agree about this post. You are amazing! Yay for a work space and I can't wait to get your book. Congrats on your book. Definitely exciting times. What a great writing space! I'm happy you got a dedicated place of your own. :) Sweet about your family's support; that's nice to read about. My hubby is WAY supportive too! It really helps. I tell my husband everyday he deserves a medal for sticking with me! That writing chair looks really comfy. Congratulations on your new writing space. Can't wait for your book to come out.